When I was home last Thanksgiving, my mom had a new quilt rack hanging in her sewing studio that my uncle made her. I got to see him the next day at our family get together and guess what? He said he would make me one as well. He asked what kind of wood and stain would I like. He laughed a little, and I am sure he was thinking I was crazy, when I said I would rather paint it. So he sent me the rack unfinished and I had no choice but to paint it black and white striped. I love how it turned out. The arms move from side to side to display your quilts. 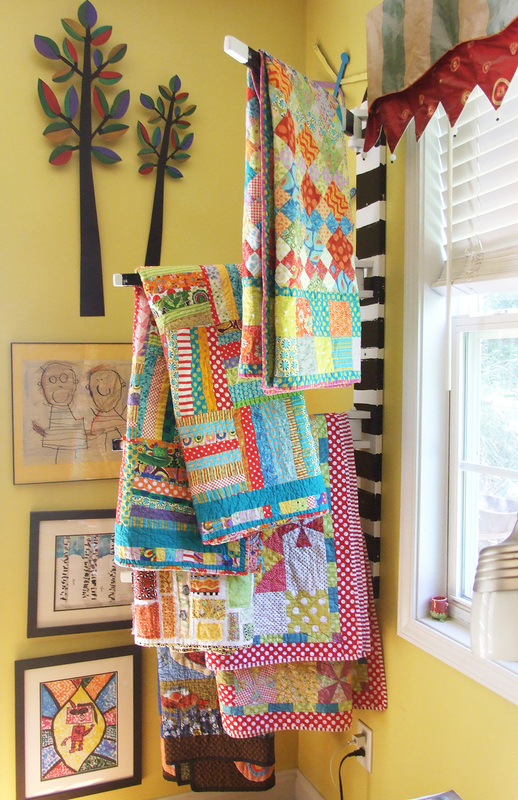 I got all of my quilts out and realized that I don't have very many made from my fabric. I guess now that I design fabric, I don't have time to quilt. Hmmm.... that needs to change. 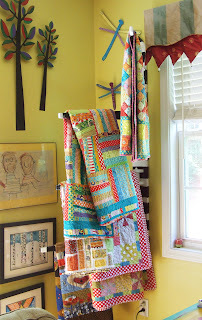 Either way I still love my new quilt rack. Thanks Uncle Wayne!